M. Night Shyamalan is back with his latest twisty-turny flick, which sees James McAvoy play a troubled guy with 24 distinct personalities who kidnaps three girls. 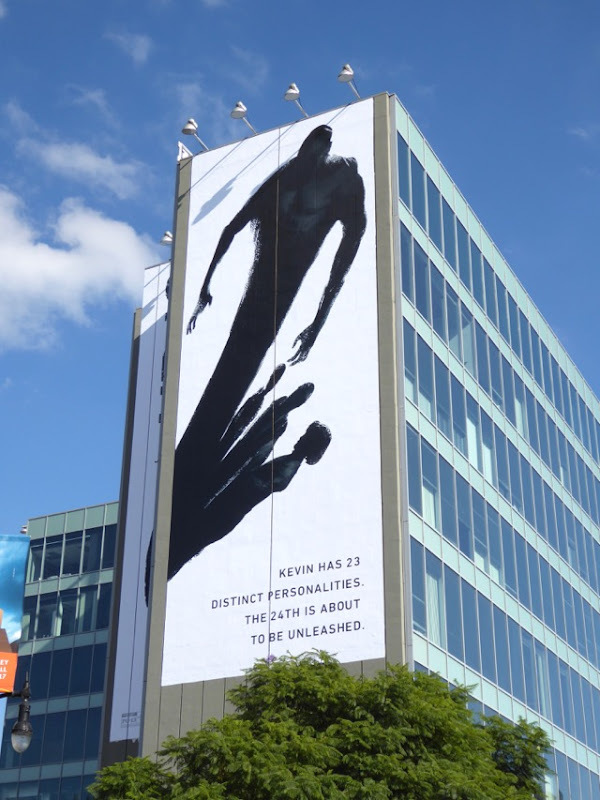 Locked in a windowless room they must try and persuade the 23 alternate personalities to help them stay alive and escape before the arrival of the 24th persona, the 'Beast'. 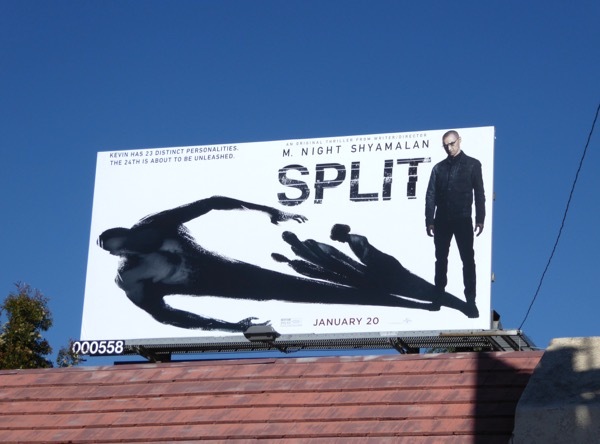 It's a bit of a coincidence that this movie about multiple personalities comes out just before FX's new X-Men inspired TV series, Legion, about a similar character with split personalities (this one with Mutant super-powers and rather interestingly Professor X's son in the comic books, who James McAvoy plays in the X-Men movies). 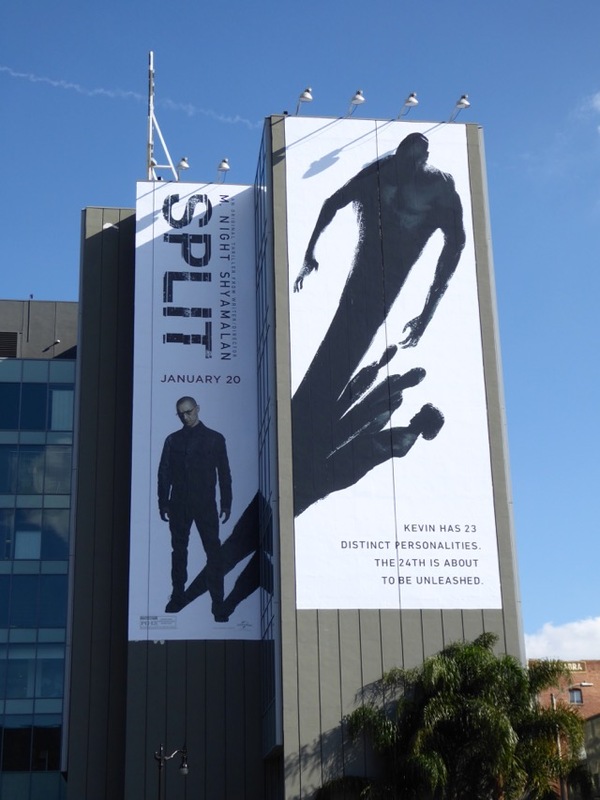 These creepy Split ad creatives help convey the idea that there's something monstrous hidden within and the smaller movie billboard was spied along San Vicente Boulevard on December 29, 2016, whilst the giant-sized version was photographed towering over the busy Hollywood intersection of Highland and Franklin Avenues on January 6, 2017. 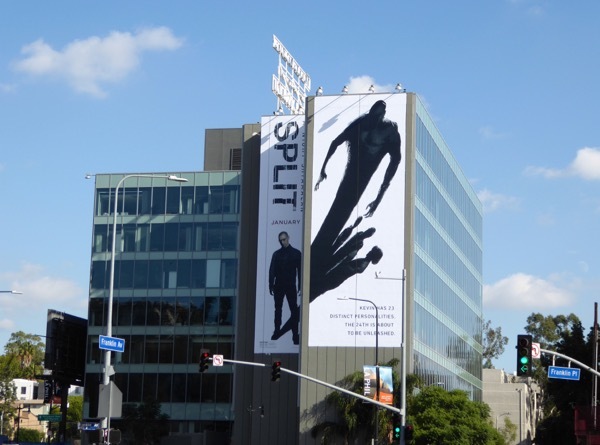 Fans of James McAvoy can also check him out in these X-Men: Days of Future Past movie billboard. Unlike his earlier endeavours, The Sixth Sense and Unbreakable, these days M. Night Shyamalan's movies tend to fizzle with their final plot twist, so let's hope Split can diverge from this recent pattern and offer a truly different and satisfying slice of horror.